Youngstown State University’s football season would be incomplete without majorettes, or Penguinettes as referred to on campus, who accompany the YSU Marching Pride. 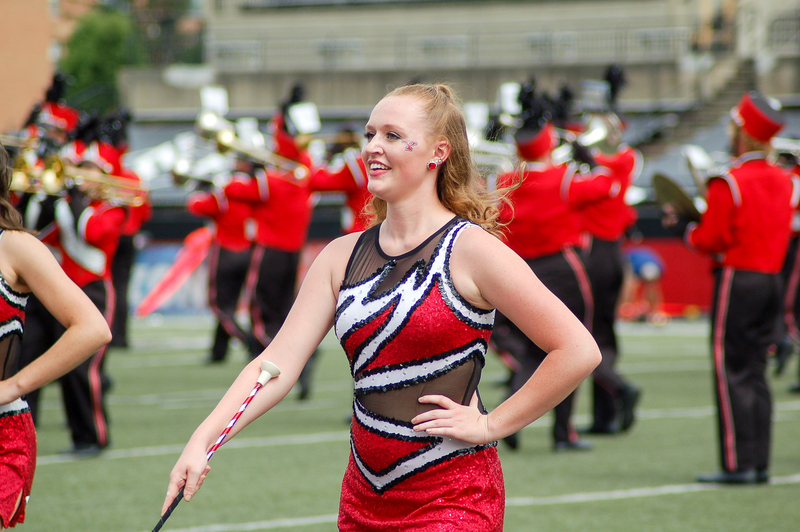 Shannon Antenucci, YSU Penguinettes advisor, is responsible for choreographing routines, running practices, organizing special events and activities and making sure the majorettes look and feel confident. In March and April, auditions are held for Penguinettes and feature twirlers. Once those spots are filled, the majorette line begins working on routines for the upcoming season. The Penguinettes twirl batons during the fight song and pregame show, but mostly dance for the halftime performance. She said although a lot of time and energy are put into each show that outsiders may not realize, the group of 15 girls somehow manages to support one another and stay positive. “With the bond that they have and kindness they give out to others, it’s no wonder that they work so well together on and off of the field. I couldn’t be more proud of them,” Antenucci said. Jenna Parkany, Penguinettes captain and a senior marketing management major, said she initially auditioned for the Penguinettes because she was a majorette in high school and was encouraged by other students on the line at the time to try out. Parkany said her overall experience on the Penguinettes line has been very positive. “I am learning to grow by being able to lead these amazing women and dancers. I could not be more proud of how respectful they are to one another and how great they represent the program,” she said. Angela Toro, Penguinette and a senior early childhood education/intervention specialist major, said students do have to audition annually to claim their spot, regardless if they have been on the line in past seasons. “Being a Penguinette is a great opportunity to show your passion for dance and twirling and to make great connections with students all cross the university and make friendships that last a lifetime,” she said. Natalie Toro, Penguinette and a senior early childhood education/intervention specialist major, wants to encourage other students to come to the football games and experience the performances put on by the Penguinettes and the YSU Marching Pride. “Being a Penguinette to me is more than dancing and twirling a baton. It is such an honorable way to represent the most visible student organization at YSU,” she said. Students interested in auditioning to become a Penguinette or feature twirler should keep an eye out for audition dates and practice dance technique, twirling skills and performance. “Being a part of the Marching Pride is such a fantastic experience. The places you go, the things you do, the memories you make and the friends you love are things that stick with you forever,” Antenucci said.